Valencia in the December is like Scandinavia in the Summer. Amazing, 20 degrees and sunshine. This trip was planned to answer two questions : a.) Am I able to handling Lifgun single handed ? b.) How I will react of sailing alone for few days. And it was for sure also a good opportunity to escape from the holiday season at home. 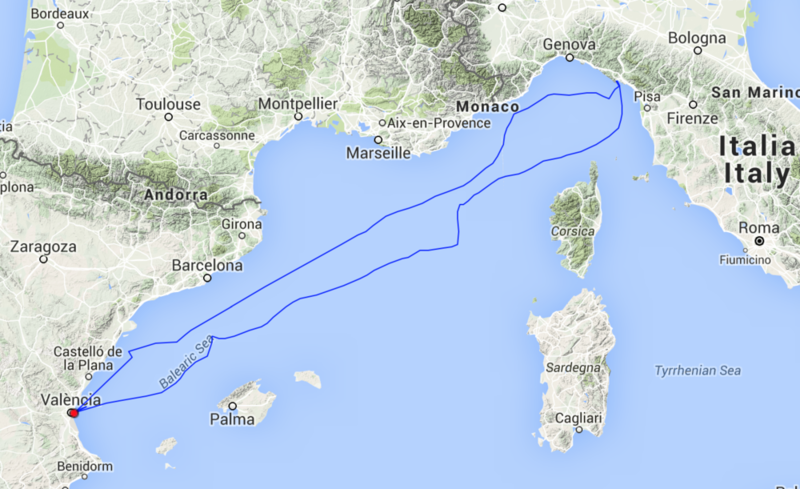 Started on December 19 at 12.15 h – heading out into the complete flat sea – direction Mallorca. Sad that there was no wind, on the other hand it gave me time to acclimate. During the night we started to sail - light winds from around 100 degrees. Nobody else was on the sea -few cargo ships – beside them, the big emptiness. Very cool. After the first night I was arrived on the boat and in the single being. So far I'd like it. After passing the north corner of Corsica I hoisted the Genaker – a couple hours later the shackle on the top of the halyard was passing away – the Genaker was taking a bath in the Med.....an was acting as a breaking parachute. My job was to bring him on board again. It shows me that the limiting factor in single handed sailing is the physic strength – for me it was possible to take him out of the water – and a few hours later he was up again. Finally arrived in Marina Fezzano di Ligure after 4 days and 6 hours -covered 616 nautical miles with an average speed of 6.16 knots. Spending Christmas together with the family in Italy , hiking around in the Apennine Mountains and eating ….. best food ever. Started again in La Spezia on December 29 around 10.15 in the morning. Based on the weather forecast I've decided to heading towards the Golf of Genoa. Cool sailing in reaching conditions. On December 31 we were sailing in perfect conditions with 9 to 10 knots from 140 degrees trough the Golf du Lyon. Very cool and very fast. New years messages sent out by Iridium and I decided to radio with the first ship which I would meet in the new Year. It was the cargo vessel FOLUK and we had a very nice chat around 2 in the morning – logical on channel 16 :-). At January 2 around 03.00 a.m. The wind starts to increase – and logical to turn to more westerly ..finally we ended uo bashing with around 40 knots of wind direction Valencia. Only some 40 th miles to go but the speed slowed down and the VMG was not very enthusiastic. However at around 2.30 p.m. fnally we arrived at Valencia – after 12 hours of fighting against the wind – it was a great first beer. Totally sailed in 9 days : 1278 nautical miles – ø speed around 6 knots. My personal conclusion of sailing single handed is : After get used to it its a very peaceful way to travel. It animates you to rethink every maneuver twice before executing, it's sometimes a bit lonely but overall I could imagine to do this again and for a longer time. The best gear on this trip was without doubt the hydro generator – he gives you the freedom of decent sailing without using any engines. After arriving in Valencia on January 2, 02.30 p.m. we did several maintenance work – which includes the fixing of the watermaker / ordering a new lazy bag / fixing some plumbing stuff and so on.